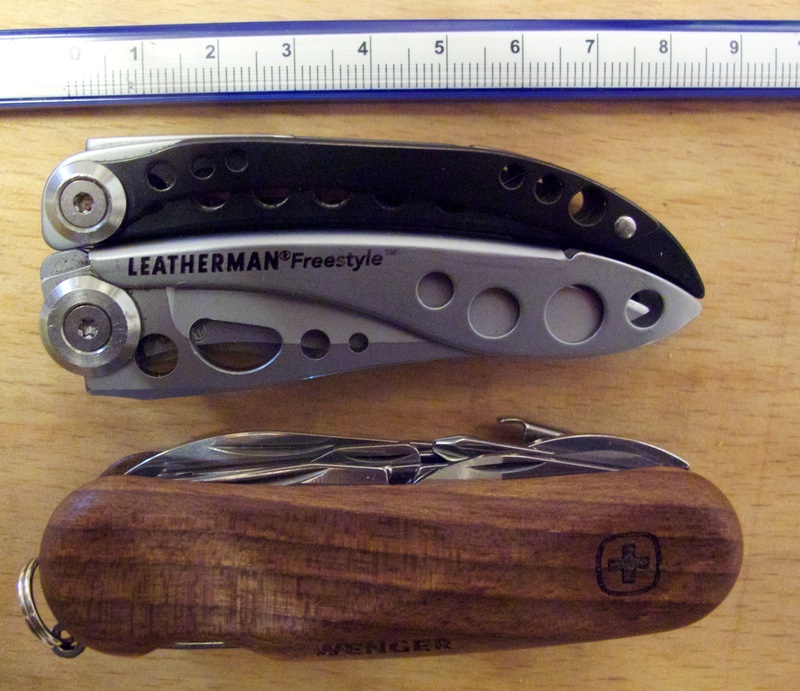 I’ve been carrying a Leatherman Freestyle for the past year or two as my ‘pocketable-EDC’ and, whilst there’s a lot to like about the Freestyle, it also has some serious shortcomings. 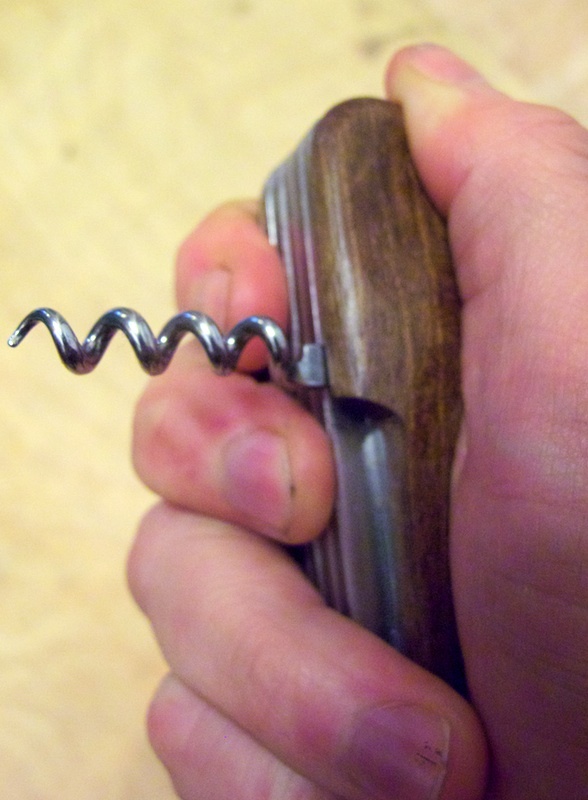 The biggest shortcoming is probably the lack of tools –having to open beer bottles by prising up the edges of the lid with the pliers soon becomes tiring! Also, the blade on the Freestyle has a series of holes drilled into it. Presumably this is to save weight but I reckon the annoyance of constantly having to hoke bits of gunk out of these holes, after cutting food far outweighs any miniscule weight saving. And finally, in this idiotic age in which we live, the Freestyle, with its pointy, metal body and part serrated blade just looks a bit too ‘aggressive’ for me to be comfortable using it in public, lest some passerby decides to report a “knife-wielding maniac” on the loose! So, I decided to treat myself to a new EDC pocketable tool. I wanted it to be comparable in size to the Freestyle, provide a decent tool-set and hopefully look as non-threatening as possible. Over the past two or three weeks, I’ve spent more hours than is good for me poring over various websites, reading endless reviews on a plethora of pocket multi-tools. Eventually, I narrowed my search down to one of two choices; go for one of the Leatherman Juice models, or some kind of Swiss Army Knife. I’ve already got three Leathermans; a Core, a Surge and the aforementioned Freestyle, so I thought I’d try something different for a change. In the past, I’ve never been a big fan of SAKs –I grew up thinking of them as more of a pen-knife with a few pointless gadgets attached than a proper multi-tool. 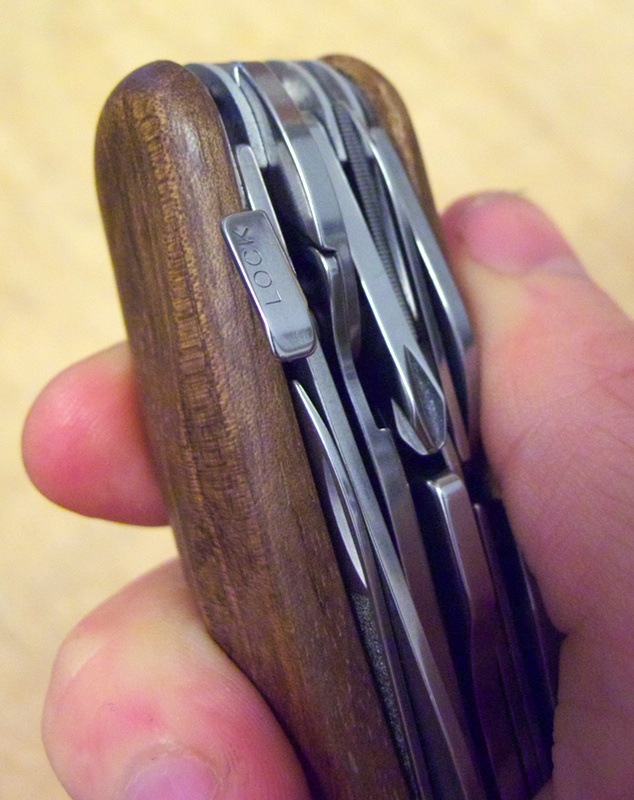 However, while trawling the web, I came across so many reviews from people raving about how they loved their Swiss Army Knives, that I decided to take another look ––especially when I found out that some SAK models now come with pliers. Pretty much essential for me, as the pliers tend to be one of the most used tools on any of my Leathermans. I narrowed my search down to a couple of different models of SAK, but still couldn’t quite get over the look of them. Compared to my Leathermans, those red plastic handles just seemed like something you’d find on a toy. 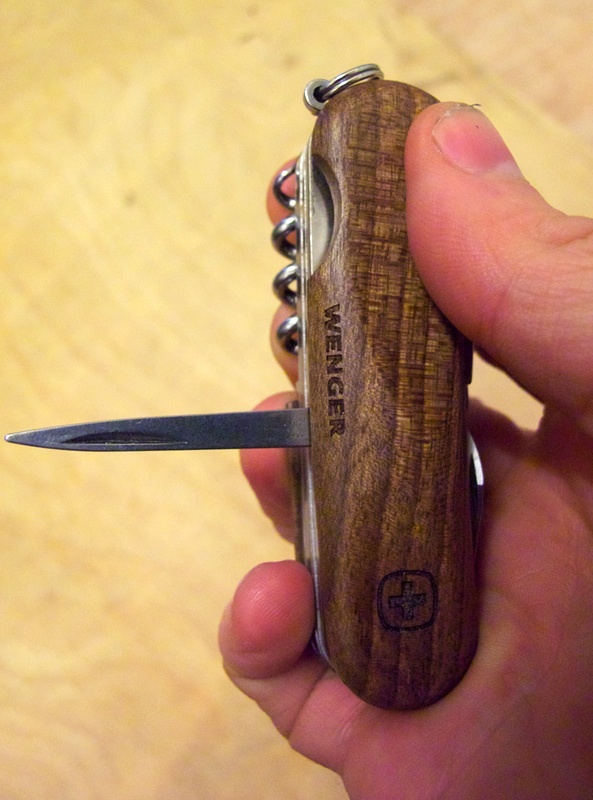 Then, whilst browsing the Wenger site, I came across the EvoWood range; Swiss Army Knives, but with recycled walnut handles, instead of yukky red plastic. 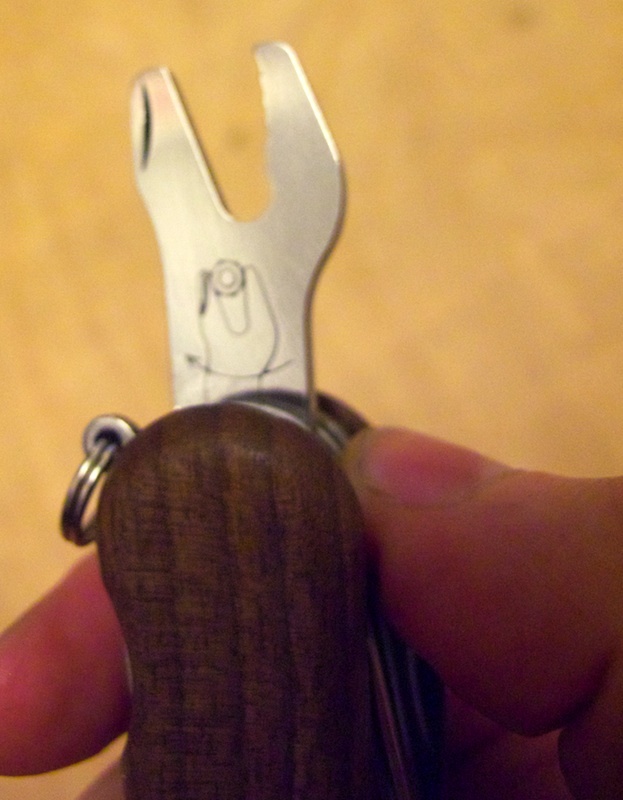 And the EvoWood S557 model had pliers! 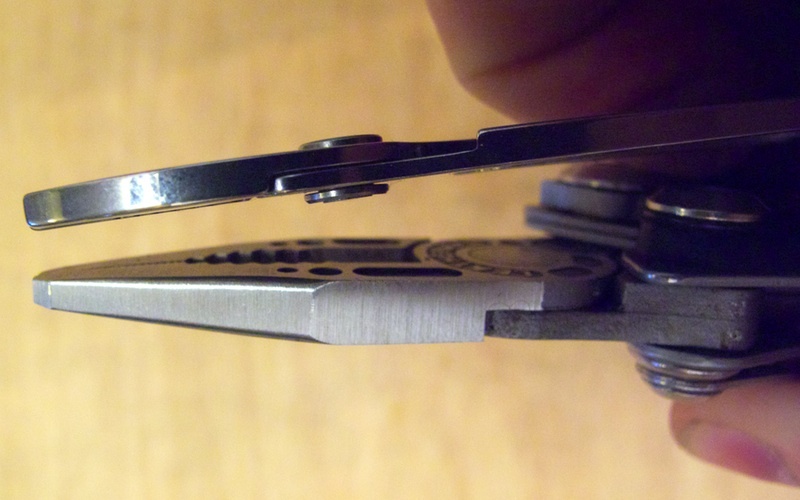 Being used to the quite chunky steel used on the knife blades of Leatherman tools, I was a bit dismayed when I opened the Wenger to find out that its blade was only about half the thickness of that on the Leatherman [it’s also about 1cm shorter]. On the plus side, the Wenger blade isn’t drilled full of idiotic holes to collect skank every time you use it to cut food! The Wenger pliers do have one trick up their sleeve tho’. 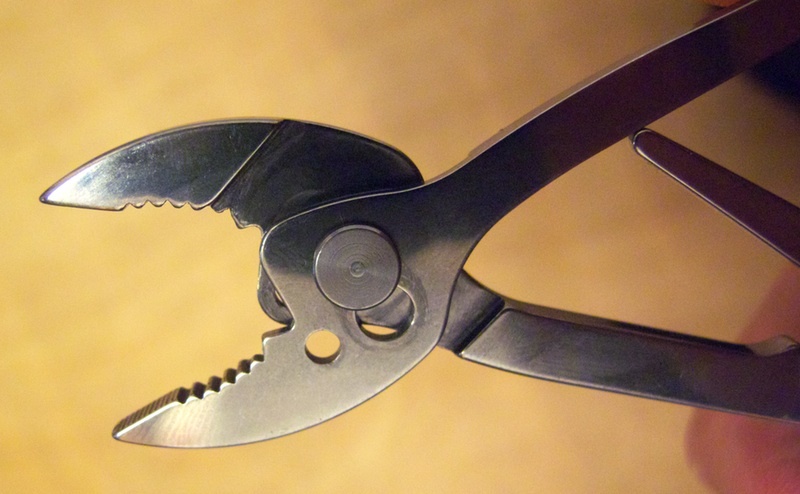 Thanks to having a ‘slip-lock’ they can actually open a lot wider than the Leatherman ones. Mind you, I’m not sure as I’d want to use them on anything hefty enough to require them opening wide enough to require the slip-lock. 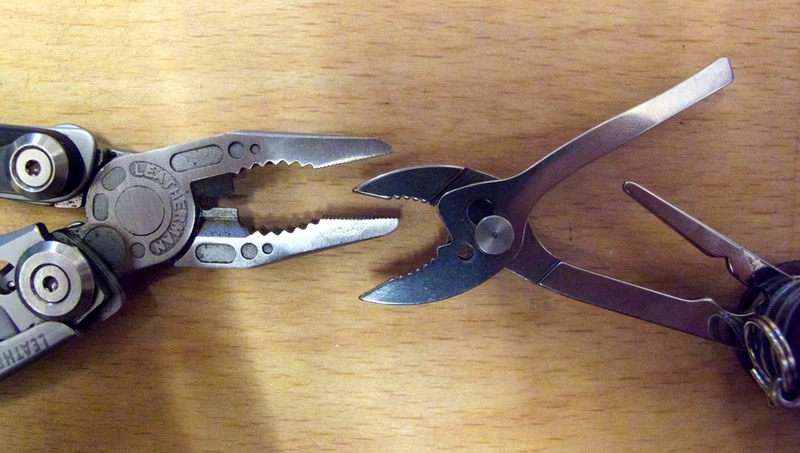 Incidentally, the other hole in the pliers is supposedly for cutting wire. The blade is 5mm wide and feels quite sturdy. 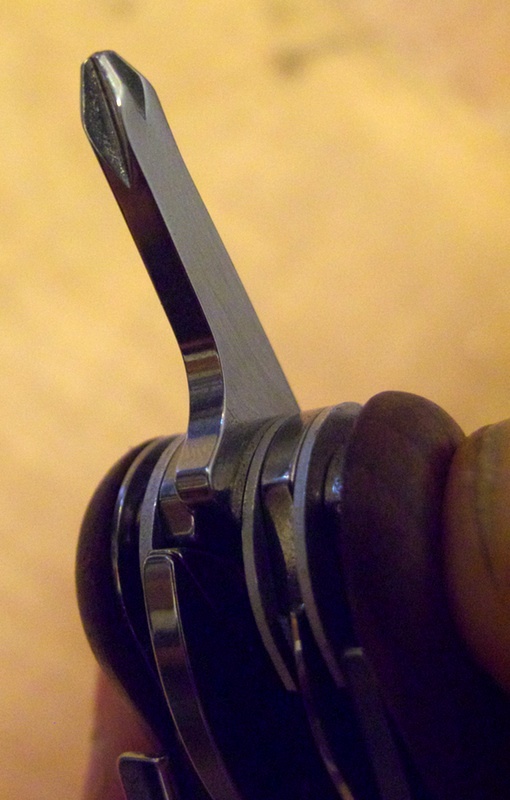 All the screwdriver blades on the Wenger use a clever automatic lock, whereby the driver retracts slightly into the body of the tool, when you put pressure on it and thus locks into position, then releases again when you lift off the pressure. 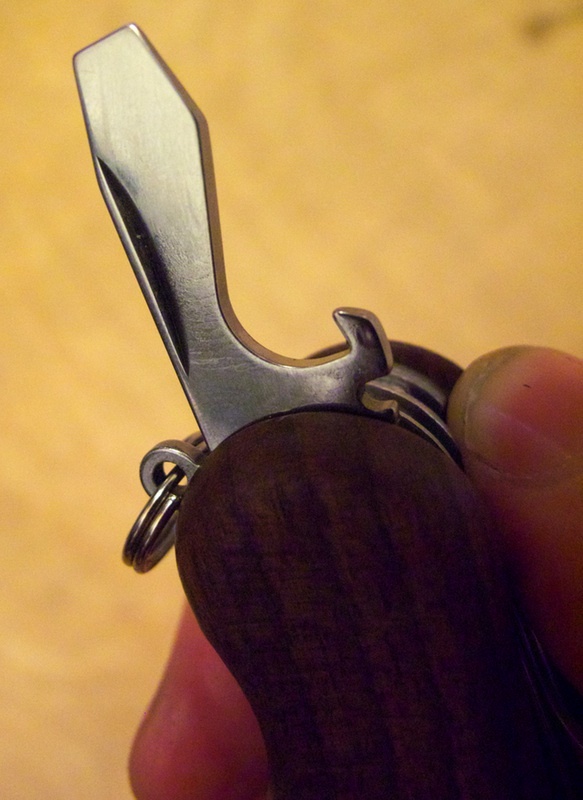 I’m not sure what the wee semi-circular cutout at the base of the screwdriver/bottle-opener is for? Not sure what size Phillips this is and I can’t be arsed digging my toolbox out to compare, but it’s a fairly useful small-medium size. About 4mm across at the widest point. SAKs are famous for having really well-designed can-openers and the Wenger seems no exception. The can-opener blade is easily as thick and sturdy as the ones on my full-size Leatherman tools, but feels a lot better engineered. 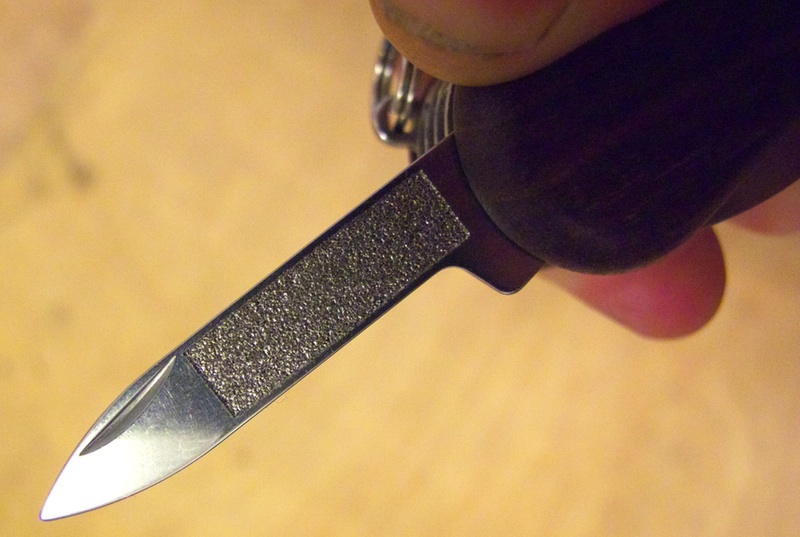 The cutting blade has a really sharp bevelled edge to it. 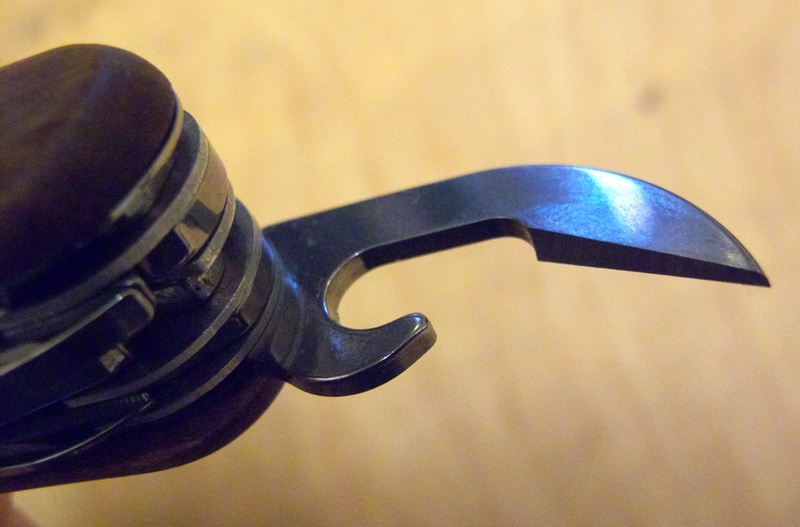 Unlike other manufacturers, Wenger have forgone the opportunity to build a small flat-head screwdriver into either can-opener or bottle-opener. [sorry the pic’s a bit out of focus!]. This is a strange one. 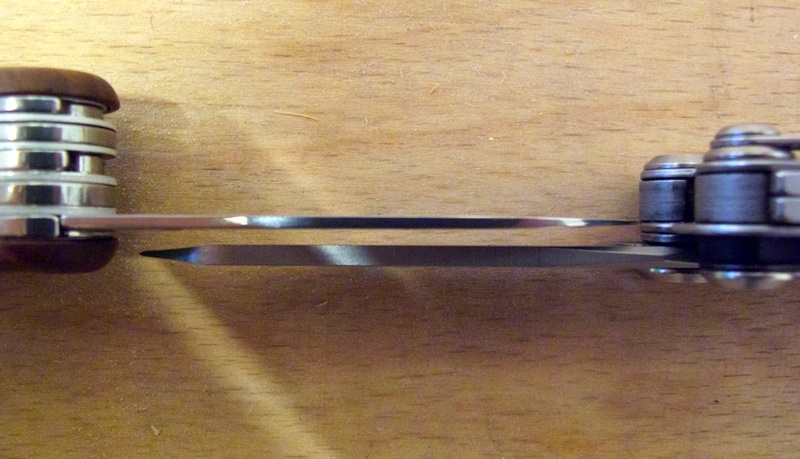 The thickest tool on the Wenger [I’m sure it’s a hairsbreadth thicker even than the pliers], the head is cut out in such a way that you use the tool one side up for tightening nuts and then flip it over and use it the other side up to undo them. I’ve had a hard time finding anything to try this on in anger, but it worked OK on some small nuts holding various bits of the frame of an old computer together. 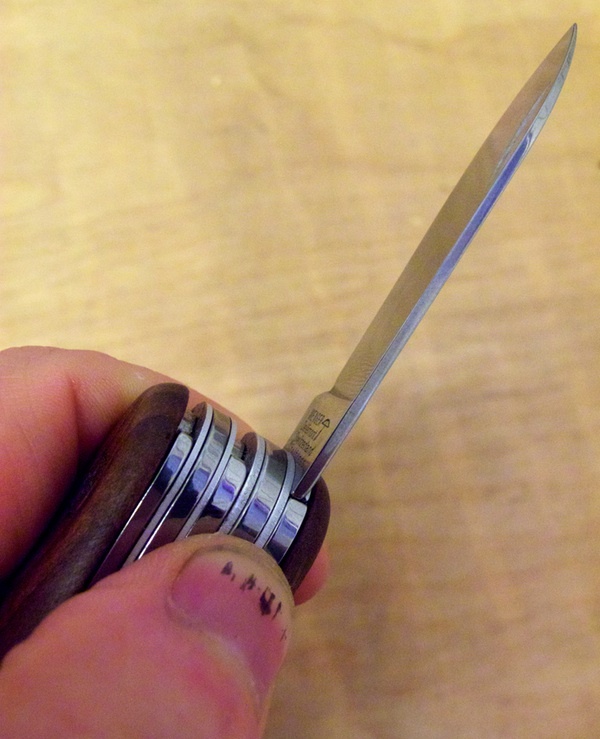 The problem I see with this tool is that it’s right in the centre of the Wenger, and it’s quite short, so I think that a lot of the time the handles would get in the way and stop you getting decent purchase on a nut, unless it was sitting proud by a couple of cm. And given the strange design of the spanner head, I reckon it would slip quite easily in these circumstances. I can’t really pass judgement until I’ve tried the spanner properly but my instinct is that I’d have preferred it if Wenger had done away with this and used the extra space thus freed up to make the pliers a bit sturdier. Not something I’d ever look for on a multi-tool. 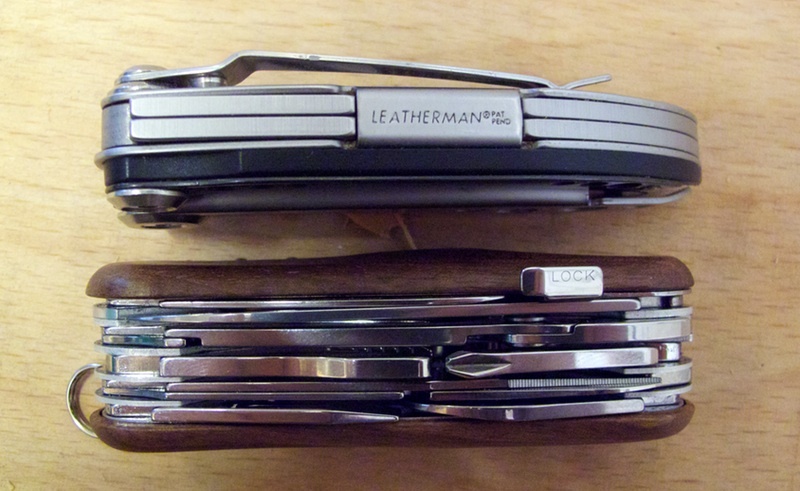 I’d much prefer a Leatherman style file. That said, I suspect that this file might be up to tackling more challenging materials than merely fingernails. Looking at the surface with a jeweller’s loupe, I can see that it is very rough –it seems to consist of tiny flecks of gold and dark-grey ‘gravel’. So I’m wondering whether it might be coated in diamond or ceramic of some kind. Strangely the Wenger website makes no mention of the nail-file having anything ‘special’ about it, so maybe I’m deluding myself here. If nothing else, the nail-file comes in handy when trimming your nails with the serrated scissors leaves them a bit rough! The bottle of wine I treated myself to over the weekend had a screw-top, so the corkscrew has not had the chance to shine yet. It seems quite well made and solid compared to some I’ve seen on other gadgets. This is a case of ‘nearly’ in my opinion. The awl is pointed but not sharpened into a point [if that makes sense]. Neither does it have an eye, which I always reckon is handy for emergency sewing repairs. I was quite surprised to see that Wenger have positioned the main knife blade on the EvoWood S557 on the right-hand side of the handle [as viewed from above]. To me this makes the knife seem set-up for left-handers [like myself] as, when holding the knife in your left hand, the blade is nearest the object you’re cutting. 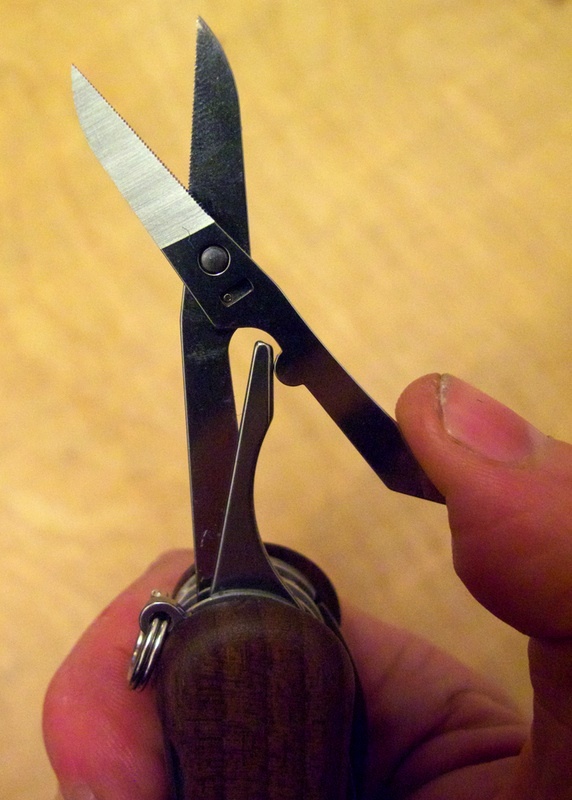 Holding it right-handed would put most of the width of the handle between you and whatever you’re cutting. This struck me as unusual, as I’m so used to almost everything in the world being designed with right-handed ergonomics. Overall I think this is a very well made tool. 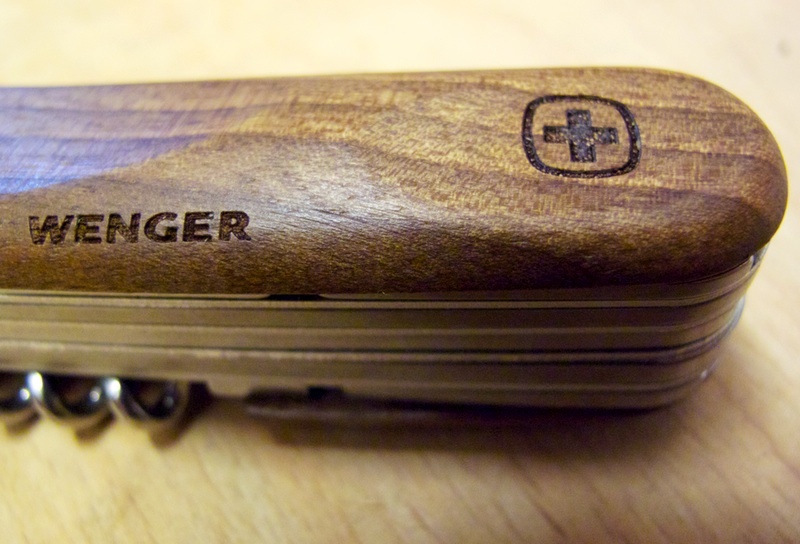 I had read a few scare stories about Wenger quality being historically not on a par with Victorinox but, as they’re both essentially the same company now, it seems that Wenger build quality has been brought up to scratch. Of course, I’ve only had the S557 a couple of days –it might fall apart in a month’s time– but it feels like it’s made to last. All the tools feel strongly sprung when opening and click into place with a nice solid click. 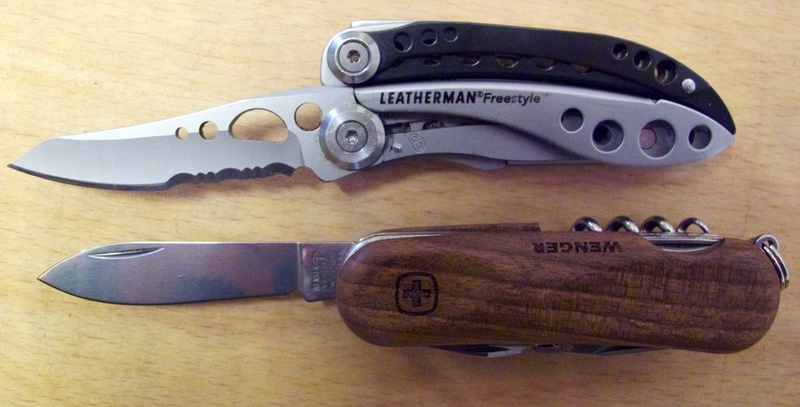 It definitely feels more carefully crafted than any Leatherman I’ve owned. Tool selection is pretty impressive for a multitool of this size. In an ideal world, I’d have preferred sturdier pliers [possibly at the expense of the spanner] an eye in the awl and a small flat-head screwdriver, but it’s a pretty useful selection nonetheless. Pricewise, I reckon the Wenger EvoWood S557 is way over-priced. As I said above, the only difference I can see between this and the equivalent EvoGrip model are the wooden handles and, thinking about it, it is pretty insane to pay about £30 more just for that. 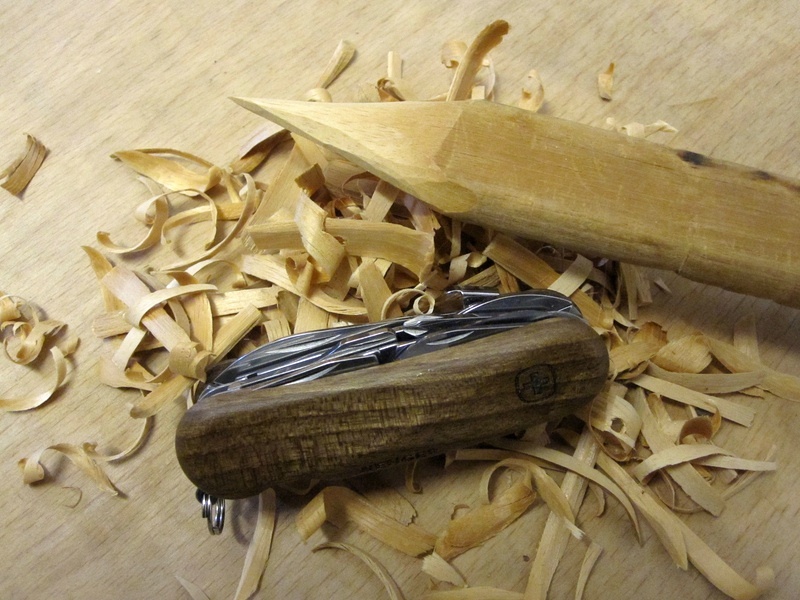 Having said that tho’, there is something about the combination of the dark unvarnished wood and the highly polished steel of this tool that just oozes class. It just looks good against wood, rocks and in ‘outdoorsy’ settings.